Progressive web apps represent the next big digital opportunity: they look and feel like native apps, they work offline, and they’re available to anyone—no app store required. But with that freedom and flexibility come challenging questions about how to create the most value for your users (and your bottom line). Jason Grigsby answers the what, why, and how of progressive web apps, from making the case in your organization to reaching your users in bold, new ways. Build your audience, increase revenue, and widen the web’s reach—all with the power of progressive web apps. This book answers every question you might have about progressive web apps, and then some. If you’re looking to get buy-in for building a progressive web app, Jason shares exactly what you need to make the case. This book does a wonderful job of explaining the history and evolution of progressive web apps, and why their renaissance has finally arrived. 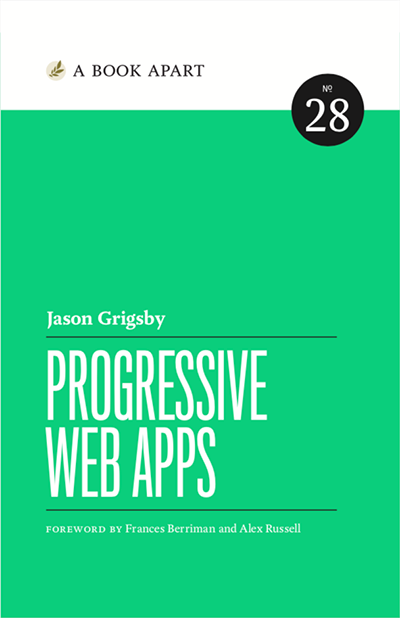 Jason Grigsby has written a practical guide to understanding progressive web apps and their considerations for businesses, marketers, and developers. Jason Grigsby gives you a comprehensive tour of how to create a progressive web app—not just the how, but also the why. If you’d like to start building progressive web apps, this is the place to start. With clarity and cohesion, this book takes you on a tour of how to build from the ground up. Jason Grigsby is cofounder of Cloud Four, a small web consultancy with big aspirations. Since cofounding Cloud Four, he has had the good fortune to work on many fantastic projects, including the Obama ’08 iOS app. He was founder and president of Mobile Portland, where he helped start the world’s first community device lab. He is the coauthor of Head First Mobile Web (O’Reilly 2011) and one of the signatories of the Future Friendly web manifesto. He participated in the Responsive Images Community Group, which helped define the new web standard for responsive images. He tracks progressive web app case studies at pwastats.com.